Fishermen and fishery managers often have few resources to help them navigate the tricky or challenging management decisions they regularly face. That’s why the Catch Share Design Center has developed a comprehensive toolkit for designing and implementing management systems that can build resilient, profitable fisheries. Back in 2010, we released the Catch Share Design Manual. It was the most comprehensive overview of catch shares, to date, and included a step-by-step process that stakeholders could use to evaluate their fishery and design a custom program suited to fit their specific needs. Most importantly, it drew on the knowledge and experience of fisheries experts around the globe. 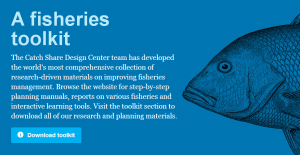 Since the Catch Share Design Manual’s initial release, we’ve heard from fishermen, managers and other fisheries stakeholders all over the world. Some of the feedback offered expertise and recommendations, while others sought advice and requested specific new research. All of it was useful and this new toolkit is a response to those requests. We all know that lack of effective management can be devastating to fish populations, the billions of people around the world who rely on seafood for protein and the millions who rely on the stability of the fishing industry to support their livelihoods. By sharing this toolkit, we are providing fisheries stakeholders with the tools needed to recover fish populations and ensure that fisheries are sustainable and prosperous in the long-term. Over the course of the next several blog posts by Catch Share Design Center team members, we will feature key topics addressed in the toolkit – Cooperatives, TURFs, approaches for data-limited fisheries and more. Each post will hit the high points that we discovered in developing our new resources. We are very excited to share these new materials and hope you find them useful, interesting and helpful. All of the documents are available for PDF download. If you would like a hard copy of the materials sent to you, or if you have any questions, comments or suggestions, please reach out to us at catchsharequestions@edf.org. This entry was posted in Domestic, International, Science/Research. Bookmark the permalink. Both comments and trackbacks are currently closed.